You are buying Abbott Glucerna Nutrition Butter Pecan Shake 8oz Each, model #57810. ADW Diabetes offers a complete line of dietary supplements for both children and adults. 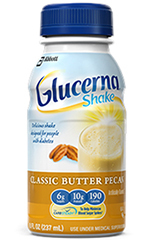 The Abbott Glucerna Nutrition Butter Pecan Shake 8oz is designed specifically to help adults with diabetes manage their blood glucose levels as part of an overall diabetes management plan. The products contain a unique, slowly digested carbohydrate blend to help minimize glycemic response. Glucerna cereals, bars, and shakes are available in consumer-friendly flavors at retail stores. Glucerna tube-feeding products for institutional use offer a variety of nutrition choices for supplemental or sole-source nutrition. Glucerna Nutrition is used as a supplement, snack, or meal as part of a diabetes management plan. For use under medical supervision. #1 Doctor recommended brand for people with diabetes. Specially formulated to help minimize blood-sugar spikes. Use as part of a diabetes management plan. Has CARBSTEADY, a unique blend of carbohydrates, including slowly digestible carbohydrate scientifically formulated to help minimize blood glucose response. Clinically shown to help people with diabetes lose weight when used as part of a structured weight-loss program. 26 vitamins and minerals for Complete, Balanced Nutrition. Water, Corn Maltodextrin, Milk Protein Concentrate, Fructose, Glycerol, Short-Chain Fructooligosaccharides, Soy Protein Isolate, High Oleic Safflower Oil. Less than 1% of the Following: Canola Oil, Soy Oil, Natural & Artificial Flavor, Magnesium Phosphate, Potassium Citrate, Cellulose Gel, Salt, Choline Chloride, Ascorbic Acid, Calcium Phosphate, Sodium Citrate, Cellulose Gum, Potassium Phosphate, Monoglycerides, Soy Lecithin, Calcium Carbonate, Potassium Hydroxide, Potassium Chloride, Carrageenan, Liquid Sucralose, Acesulfame Potassium, Ferrous Sulfate, Magnesium Chloride, Zinc Sulfate, dl-Alpha-Tocopheryl Acetate, Niacinamide, Manganese Sulfate, Calcium Pantothenate, Cupric Sulfate, Vitamin A Palmitate, Folic Acid, Thiamine Chloride Hydrochloride, Riboflavin, Chromium Chloride, Pyridoxine Hydrochloride, Biotin, Sodium Molybdate, Potassium Iodide, Sodium Selenate, Phylloquinone, Cyanocobalamin, and Vitamin D3.